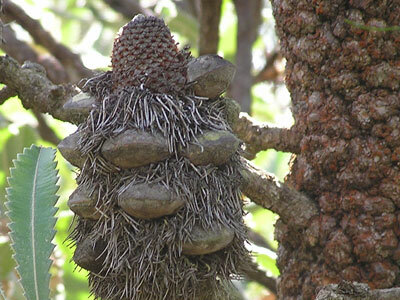 To many Australians, Old Man Banksia is best known as the bad Banksia Man in May Gibbs' stories of Snugglepot and Cuddlepie. Even when we grow up, we look at Old Man Banksia cones warily. There's a tradition in our family of giving Snugglepot and Cuddlepie and Dorothy Wall's Blinky Bill to the first born in the family. Both books are considered classics in Australian Children's literature. 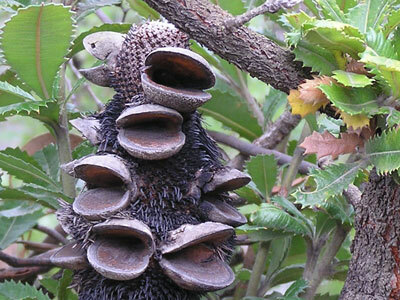 Old Man Banksia is also known as Saw Banksia or Saw-toothed Banksia due to its serrated edge leaf. It can found along the Eastern Coast of Australia from Melbourne to southern Queensland and inland to the coastal ranges. It flowers from Summer to early Autumn. 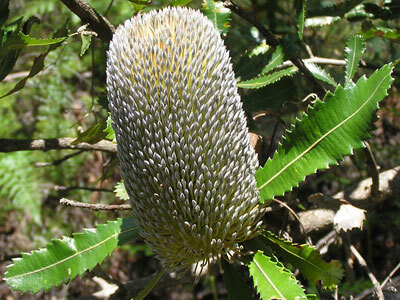 Unlike Banksia ericifolia, Banksia serrata is not destroyed by fire. 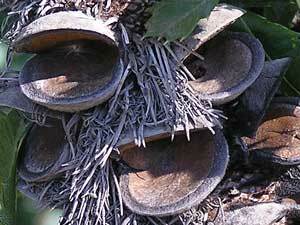 It regrows from lignotubers underground, epicormic buds under its bark and seeds. The image to the right shows that the cone has been burnt and its seeds released. The bark would have been burnt and shed, and new leaves have grown from the epicormic buds protected by its thick bark. The image to the left shows a seedling. 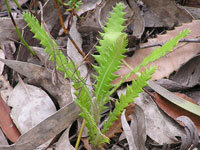 Its leaves are narrower than the parent's but clearly a Banksia serrata. The image to the right shows the distinctive serrated leaf and gnarled trunk of the Banksia serrata as well as an unopened cone. 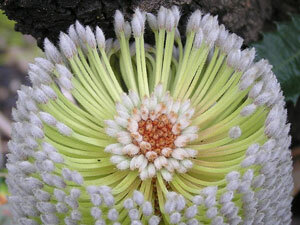 Old Man Banksia is very similar to the Wallum Banksia (Banksia aemula). The only reliable way of telling them apart is by their stigmas - Old Man Banksia's being twice as long. The photos were taken in the upper Blue Mountains and the Lane Cove National Park.